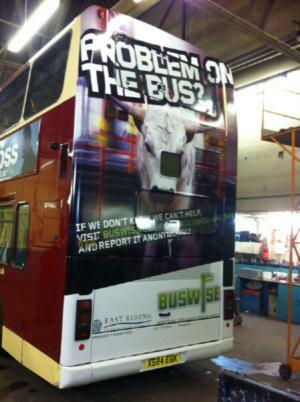 East Riding of Yorkshire Council, supported by local schools and East Yorkshire Motor Services (EYMS), is excited to announce the latest Buswise advertising campaign to tackle bullying and anti-social behaviour on home-to-school transport. Buswise is a single point of contact for all issues relating to school bus services, offered to pupils throughout East Riding, and allows drivers, passengers, parents and members of the public to report incidents of concern. Since its launch in September 2008, Buswise has evolved to include educational sessions in primary and secondary schools and driver training sessions in partnership with EYMS. To raise awareness of bullying and anti-social behaviour, an EYMS double decker bus has been ‘wrapped' in a huge eye catching poster. The bus will operate throughout the East Riding and will raise awareness to children and parents that Buswise offers a discreet reporting system for them to register their concerns. Issues being reported are then sent to schools or operators for further investigation, with feedback provided where appropriate. The double decker bus will be on public service from Monday, 7 January 2013. Buswise acknowledge that the vast majority of passengers behave very well, however there are a small minority of pupils whose behaviour is of concern. Councillor Jackie Cracknell, cabinet portfolio holder for community partnerships at East Riding of Yorkshire Council, said: "Anti-social behaviour on buses will not be tolerated. Officers from the council's anti-social behaviour team will be working with those responsible and their parents to try and address their behaviour and any underlying reasons behind it.